E Shop Hosts have just launched a Discount Club that generates a 10% discount on all domain registrations and renewals as well as all other products available on the E Shop Hosts web site such as hosting accounts and SSL certificates. Many of our existing clients who have already registered 10 domains or more with E Shop Hosts have had their accounts upgraded to Discount Club Status for Free!! Thats our only criteria to get the Free account upgrade, the E Shop Hosts Discount Club membership is free to any client who has purchased 10 domain registrations on E Shop Hosts and all clients who currently have a minimum of 10 domains registered with us will have already been automatically been added to the Discount Club. New to E Shop Hosts? If you are a new client to E Shop Hosts then you can also take advantage of Discount Club membership and benefit from the 10% discount on all our ecommerce products and services including our E Shop In A Box ecommerce web design and hosting package, regular hosting accounts, domain name registrations and SSL certificates etcs. To join the E Shop Hosts Discount Club, all you need to do is pay our low annual membership fee of £25 and you will then get access to all our products at the discounted rate. Here are some typical products that many of our clients have purchased through E Shop Hosts with revised prices of with the discounted rates applied. SAVE all year long on our already competetively priced hosting, domains and ecommerce solutions. Whether you buy one product or 100’s you can benefit by being a member of our Discount Club! 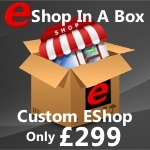 For example, if you intend to take us up on our E Shop In A Box package, by becoming a Discount Club member you will save £30 of the initial order price of £299.99, as well as saving each time the monthly/quarterly/annual hosting fee is due. By joining our Discount Club you will get an automatic 10% discount on all E Shop Hosts ecommerce products, including our hosting accounts, ecommerce website design to domain name registrations/renewals etc and SSL certificates…. in short, everything on E Shop Hosts. Have a question about our Discount Club?